Glad to be a Girl: And I'm Off! Ooooops. Entirely forgot to post earlier in the mad rush that was my afternoon. Will squeeze in a very brief re-telling of it now, because then I have to get packing! So I sort of had that camera brain wave yesterday and after an sms last night from @saulkza, it struck with full force. I was decided. I was going to acquire for myself the Canon EOS 1000d, apparently Incredible Connection had a special on! Oh the timing, can you spell "meant to be"? At lunch today I headed off to Woodmead (nearest spot with the two shops I needed to visit) and returned my Outdoor Warehouse Thermals. Let me explain. I'd bought them when we'd been there on Saturday, although I wasn't especially thrilled with the light blue nature of them ... And then while at Cape Union Mart yesterday I saw their thermals, 30 Ronts cheaper (per item, that's a total of 60 Ronts saved) and in nice and neutral black. If I could return the original ones, I was so going to! And I did. And yesterday afternoon after work I headed to my local Cape Union Mart, again (they're starting to recognise me now!) and purchased the cheaper black ones. I'm very happy with this upgrade. And during lunch I also hit the Woodmead Incredible Connection ... saldy it turns out their sale is only starting tomorrow, the 22nd :P But the dude did say if I went back after 4pm they'd probably be able to offer me the sale price. So I duly went to the Incredible Connection (who I'd usually be refering to as Incredible Rip-off, except they are in my super good books right now) nearest me after work. OMG. They did not have anything but the Canon 450 on display (panic sets in). But the dude goes and checks the computer for me. They happen to have 3 in stock. At that moment I breathed a heavy sigh of relief. And then he tells me they're R6000 something (at a photo shop I priced earlier, the camera was selling for R6999). No no, I say, I want the special. 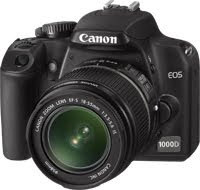 The Canon EOS 1000d, it's 18-55mm lens, a Lowepro Bag and a 2GbSD Card for R5999. That's what I came here for ... after 4pm. I *need* this camera (I have long ago decided not to chance my luck on duty-free shops en-route to me destination) and I need it *now*, I'm flying tomorrow, I explain. He goes to ask his Manager who thankfully agrees. Now I'm going to have to play around with it on my hours of wait in foreign airports, I bet it'll keep me plenty busy ;) Then it was briefly home for a bit of a run-around for the buns. And to marvel at the plants I've grown from seeds (my black-eyed susan has it's first flower and I have a *red* nasturtium!). And to charge my new battery and unpack the myriad of packages that came in my Canon Experssions Kit. I hope you have a magnificent trip! Take LOTS of photos for us with your new toy. Enjoy! Wishing you the perfect time. Very clever camera shopping!!! Hope you have a fabulous trip!!! Hey I got a Nikon D5000 before I went on hols to India.. I took the manual with me for some light reading.. it was like going back to school. Take some great photos!